This is one of those books that I'd recommend to anyone with any reason to give gifts to children. Not just for parents and grandparents- because you'll be able to find the age appropriate gift in this book, and most of them are inexpensive and fairly quick projects. So I'm going to start with the really good news- I talked to the Storey Publishing about my FAVORITE project in this whole book, and they quite kindly are allowing me to post here for all of you for free. Hexie Pouf designed by Adrienne Lodico from Little One-Yard Wonders by Rebecca Yaker and Patricia Hoskins, photography (c) by Julie Toy, used with permission from Storey Publishing, 2014. The Hexie Pouf! This reminds me of the big floor pillows my mom had, but more stylish and completely up to date- these have covers that can be washed, and are perfect for a lot of ages. I want a stack of them. Spoonflower's Eco Canvas is the right width, so you can even get custom printed fabric to make them. There are so many really clever and really cute projects in this book. 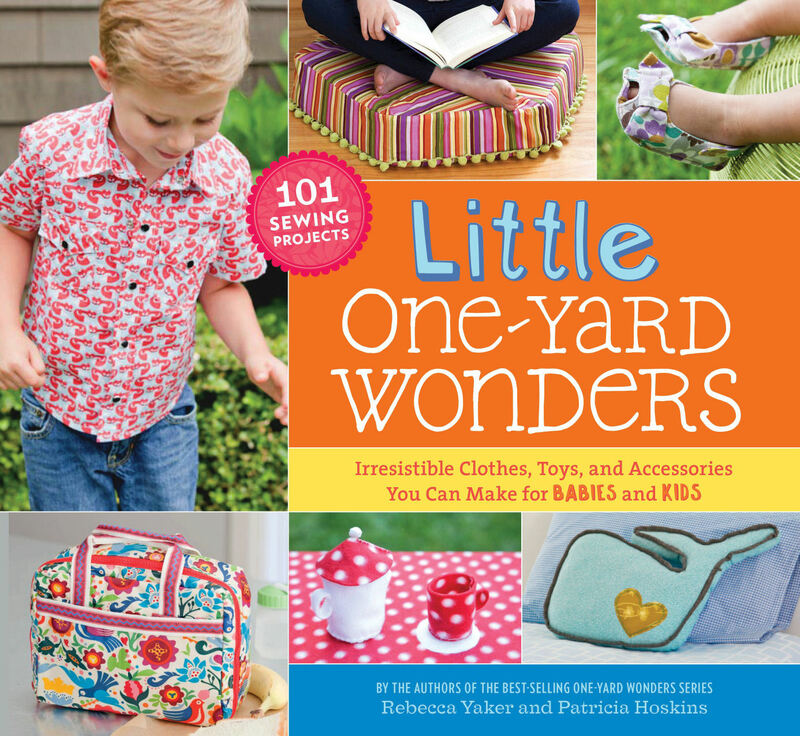 Like the other One Skein and One Yard Wonder books, these are collections of projects by different designers in different styles. This has some great things for boys as well as girls or things like the Hexie Pouf that are easy to customize to suit different tastes. Clothes- a tiered skirt that looks just like the ones my mom made me, the adorable shirt you can see on the cover, a Monster towel, and a fleece hoodie. Complete instructions, gorgeous photos, patterns and drafting instructions included. The book is spiral bound so it will lie flat while you're working and the patterns fit into a sleeve on the inside front cover. The range of projects, ages and the fact that most of them are easy enough for a beginner but still very stylish, trendy, and usable make this a book that I happily recommend. Like Storey Publishing on Facebook for giveaways, recipes, projects and news about new books.